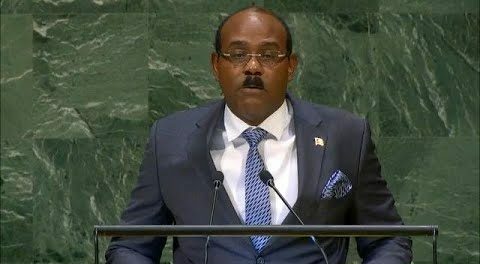 The Honourable Gaston Browne, Prime Minister of Antigua and Barbuda National Statement, 73rd Session of the United Nations General Assembly, September 28th 2018. Year after year, government leaders from across the world, travel to this hall in the United Nations Organization, in the hope of finding a pathway to universal peace and progress, that has persistently eluded us all. The peoples of our nations – rich and poor, large and small – have long since stopped paying attention or caring about what is said here. For them, this place is a talk shop where much is spoken, and not enough is being done to change their lives, or to give them good reason to believe that better is coming. What they know, is that they live in a world in which one percent of humanity, controls more wealth than the other 99 percent. What they see, is a world controlled by a few powerful nations, who impose their will on all others, in perpetuation of a system of sectional dominance. To the children of Syria, Palestine, Israel, Yemen and Afghanistan, who do not know a life without war, without bombs, without conflicts and without violent confrontation; the promise of turning swords into ploughshares is a meaningless phrase. To the people in sub-Saharan Africa, and many parts of Latin America and Asia, the World Bank’s dream, emblazoned at its grand entrance in Washington, of a world free of poverty, continues to be a nightmare that they live in every waking moment. The fundamental undertaking by all nations set out in the Charter of this body, to “reaffirm faith in fundamental human rights, in the dignity and worth of the human person, in the equal rights of men and women and of nations large and small”, contradicts the reality of refugees from Africa, from Latin America, from war-torn countries, who are forced to flee their homelands to the borders of the rich – some, literally, in cages. So, why then did I too travel here? Why am I standing at this podium, when I could be in my own country tending to its affairs and trying, as best I can, to the improvement of my people’s lives? I am here because none of the crises I just described exist in isolation. Each of them engulfs us all. And, at least, in this forum, I can raise my voice for the disadvantaged and dispossessed, including my own people. History has taught us, that no nation should believe that its individual oasis of wealth, prosperity and advantage can continue to exist and expand, if the rest of the globe is a wasteland. The world is a global neighborhood. No place on our plant is distant any longer, nor are the issues that plague it. The hopes and aspirations of these communities and, yes, their terrors, their torments and their fears are shared by everyone. And, if they have not yet reached your doorstep, at the rate we are going, they are coming soon. Walls around the rich, can’t keep-out diseases that are carried on the winds blowing from neglected pools of poverty. Migrants will not halt their determined trek from their homelands in search of better conditions until circumstances in their own countries improve. And, while the governments and political parties in those countries bear a great responsibility to respect and uphold the human, civil and political rights of their citizens; the global community, particularly the rich, has an obligation to contribute to the economic development of those countries. For, human freedoms, like fragile plants, even in the purest air, cannot take root and thrive in conditions of deprivation and dispossession. For all these reasons, collectively our nations, acting in a united way, must act to improve the human condition. And that is why the revitalization of this UN General Assembly is vital, urgent and important. For instance, without the inclusion of all member states of the United Nations in the discussions of global financial reforms, there can be no real comprehension of the grave vulnerability of small states to external shocks, high levels of poverty and high debt to GDP ratios. A few privileged nations are making decisions that impact the livelihood of billions. The exclusive clubs of the G7 and G20 cannot repair the fragmented international financial system, without taking full account of the circumstances and views of the majority of the world’s nations. Nor can the Commission of the European Union, which now seeks to impose its own anti-competition, high tax policies on developing countries around the world. Limits in participation, limits ideas, innovation and human development. Arbitrary rules, set by unrepresentative bodies, for their own narrow purposes, have no legitimacy in the world. Enforcement of those arbitrary rules by threat and sanctions of the mighty is not legitimate. It results only in grumbling and reluctant acquiescence that lacks enduring support. Might by enforcers does not make their actions right. That is why this United Nations General Assembly must be revitalized. Its revitalization would serve to give this gathering relevance, and to address meaningfully the indifference of the peoples of the world, about which I spoke at the beginning of this statement. The special value of the General Assembly is its universality of membership and the fact that the voice of every member state can be raised. But it must be seen to be more than a place for talk; it must be a place for action and for results. For years, the General Assembly has been marginalized by the Security Council, and by the notion that a small group of powerful countries, should make decisions for the rest of the world. That erroneous thinking has crept into every multilateral organization. It is so in the World Trade Organization; it is so in the International Monetary Fund; it is so in the World Bank. This United Nations General Assembly must become the principal organ of the United Nations system – the only system which every nation of the world accepts and to which they all subscribe. That is what the United Nations Charter promised; it is what nations expect. The failure to deliver on that promise has undermined multi-lateralism, encouraged the abuse of power, and frustrated people all over the world. Unless, the General Assembly is revitalized and made relevant, the actions of the Security Council, and of other organizations, will be endured but not embraced; they will be accepted but not respected; they will be enforced but not legitimized. Despite the risk of my call falling on deaf ears, I hereby make the call once again, for a reinvigorated and relevant UN General Assembly. I recognize that it would not serve the interests of the powerful, who fear the expression of dissent and the call for political rights, that many of them demand in other countries. But, I would be neglectful of my duty of care and responsibility to the poor and vulnerable, and to the silenced and stifled, if I did not raise this clarion call for greater and fairer representation for all the world’s peoples. As the leader of my country, I put its interests first. However, I know that in standing-up for my country first, it would be foolhardy to stand-up for my country only. That would be a dog-eat-dog policy, which, if practiced by every nation, would result in short-term gains for the richer ones, but ultimate losses for all. My country would soon run-out of friends, run-out of foreign investors, and, more importantly, run-out of markets for its goods and services. And, the analogy applies to countries much larger than mine, even the richest and most powerful, even those who believe that they are invincible. For when they have weakened all others to strengthen themselves, to whom will they sell their goods and services and how will they maintain their high standard of living and increase their wealth? Humanity in itself is our global community, providing us all with enduring citizenship. Loyalty to myopic, nationalistic ideals cannot trump patriotism to our common humanity. I recognize that, today, all nations of the world are interdependent in the effort to stop the spread of disease; to curb the effects of climate change; to make our people safe from terrorists and organized crime; to share knowledge and technology; and to have access to each other’s markets to trade in goods and services, thereby improving the lives of all people. Today’s world will only maintain and broaden peace, security and prosperity by international teamwork. No one nation, however powerful, can go it alone. That is why my country supports denuclearization by North Korea and Iran. It is why we would like to see all countries halt their nuclear arsenals. Global peace will not be won by a balance of terror. And, that is what pointing nuclear warheads at each other is all about – a balance of terror. It is a zero-sum game that is playing with the survival of our planet and all humanity. No one should be playing that game, no matter how rich or powerful. 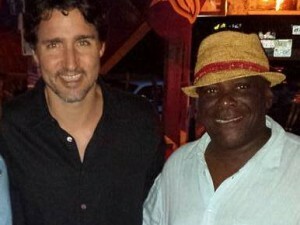 In my country’s own Caribbean region, we strongly advocate a zone of peace. For too many centuries, our area has been the location of other peoples’ conflicts and ambitions. We had no say in those conflicts, which have left our region with a long shadow of stunted growth, dispossession and underdevelopment. We want no more to be the theatre of proxy wars by others. We want the chance to grow and develop, to claim a place under the sun and to make our own unique contribution to human progress. For that reason, we welcome a recent visit to Cuba by the Chairman of the Senate Foreign Relations Committee of the United States, Mr. Bob Corker, to talk about relations between the two countries. We understand that progress is never made in a straight line. There have been many zigs and zags. But after five decades of imposing a trade embargo on Cuba, the senselessness of this policy should be obvious to all. It is time to end it, and to provide the Cuban nation with the chance they have been so long denied, to put their well-known talents in medicine, in the arts, in music, in education at the disposal of all humanity. and cooperation that offer beneficial prospects for the peoples of both countries, and by extension, to all the Americas. In the same vein, we urge all nations to recall that the countries of this United Nations, thirteen years ago, committed themselves to the responsibility to protect their own populations from genocide, war crimes, ethnic cleansing and crimes against humanity. What we did not do was to give any country, or group of countries, the right to intervene, uninvited, in the affairs of any other country. We certainly did not authorize military intervention in any way, shape or form. What we agreed was a collective responsibility to encourage and help each country uphold its individual commitment to protect its own people. And, we declared our preparedness to take timely and decisive action, in accordance with the United Nations Charter, to help them to do so. We all know that, in the words of the Charter itself, “Nothing contained in it shall authorize the United Nations to intervene in matters which are essentially within the domestic jurisdiction of any state”. In this connection, when this 73rd General Assembly once again discusses this matter, we must strongly discourage bellicose talk of military intervention in any state, by any other state, or group of states. The responsibility to protect must not be used as political cover for vigilante action, to justify intervention in any country. Encouragement of military interventions would mortally wound the United Nations as a legitimate and effective body. That is a prospect to be firmly eschewed. Therefore, when, and if, the United Nations decides that democracy and human rights have been emasculated by tyranny in any country, it is the United Nations collectively, that must authorize and carry out any agreed action. “If the United Nations once admits that international disputes can be settled by using force, then we will have destroyed the foundation of the organization and our best hope of establishing a world order”. This United Nations must always be a manifestation of the better angels of our common humanity, through which we must seek a world of security and freedom, governed by justice and moral law. Together, we must assert the pre-eminence of right over might and the general good over narrow sectional aims. That is why my country calls for a renewed commitment to multilateralism and a rejection of trade wars. Goods and services together represent 28 per cent of global Gross Domestic Product. But, escalation of trade wars will lead to severe disruption across the globe. No country will be spared, and the worst affected will be those who wage these wars. That disruption has already started, and its effects are being felt globally. Already, even though my country is not involved in a trade war, it is experiencing the downside of trade wars between our trading partners, as prices of our imports from them rise, pushing-up our cost of living. The World Trade Organization (WTO) is not a perfect mechanism for solving trade disputes but walking away from it or tearing it down would do nothing except destabilize the world’s trading system, that is fundamental to the well-being of all. It is up to all nations, rich and poor, to make the system work by improving it and by honouring their individual commitments. After 15 years of winning an arbitration at the WTO, my little country is still awaiting an acceptable settlement by the United States, to honour its obligation to us. The US economy is 20,000 times larger than Antigua and Barbuda’s. Compensation for the injury to my small country is less than 0.008 percent of one year of the US’ GDP. The injury that was done to my country’s economy now amounts to over 20 per cent of its GDP. No country can easily absorb that severe blow which hurts our economy, sets back our infrastructural development, and constrains the provision of employment and advances in health and education. That my people survive that pain, speaks to their resilience of which I am very proud, but they should not be made to endure it. Of course, the WTO is powerless to enforce its own awards, and my country has no means to do so. We rely on respect for the international system, on adherence to international law, and on the conscience of the mighty, to do right to the weak they have injured. That is a struggle in which my country will continue to engage; not in anger and not in enmity, but in calm and in comity until justice is achieved. We owe it to our small island community, not to rest until justice is done. In the context of justice, the refusal by some countries, particularly, those that are the worst contributors to greenhouse gas emissions, to admit to the harmful effects of Climate Change and to take remedial action, is an act of injustice. Small countries, such as Antigua and Barbuda, contribute the least to harmful carbon emissions – less than 0.01 per cent. Yet, along with other small states in the Caribbean and the Pacific, we are its greatest victims. The injury to our countries continues without compensation, causing our economies to decline; creating refugees within our own states; scaring away foreign investors; escalating the costs of insurance and rebuilding; and increasing the level of our debt. Last year’s hurricane season cost the Caribbean region over 150 billion dollars. To put this in perspective the overall economy of the 14 member-states of the Caribbean Community (CARICOM) totals 80 billion dollars. This means that the damage to countries within our sub-region last year alone, was almost twice the size of all our economies combined. Almost a year ago today, a CARICOM-UN High Level Pledging Conference was convened to assist Caribbean countries that were affected by hurricanes Irma and Maria. Billions of dollars were pledged, even though the pledges were insufficient to meet the costs. Unfortunately, less than half the pledges have been delivered. Reconstruction is far from done; rebuilding lives, and livelihoods will challenge us for some time to come. The Caribbean has been fortunate this year that we have, so far, survived the hurricane season. We watched in anguish and with enormous sympathy, the destruction wrought by Hurricane Florence on the Carolinas in the United States. We mourned the loss of lives – a pain we know only too well. What the destruction of the Carolinas this year, and the ruin of Caribbean countries last year, emphasized to us, is that borders may separate nations, but they do not insulate them from the shared dangers of Climate Change. Sovereignty and patriotism do not give sanctuary from calamity; disaster befalls the wealthy as well as the poor. That is why we continue to urge a global policy dialogue that integrates environment with development and that accepts the fundamental understanding that every country – with no exception – must play a meaningful role, within its means, to stop the persistent deterioration of human life caused by Climate Change. The problem is global; the solution is global. What the world needs is a recommitment to the Paris Accord including committing to the replenishment of the Green Climate Fund and the Adaptation Fund. On behalf of the people of my country, the people of the Caribbean and Pacific Islands, the people who live in the eye of storms, such as those on the Eastern Seaboard of the United States, I urge all countries to come to the table of dialogue, and to stand by the agreements we make and the treaties we sign. Our shared planet, and our common humanity depends upon it.